it’s never good when a girl says “we need to talk”.. . . and this isn’t going to be good. but i have to do this. i really do. no question, you’ve been there for me all through the years. in cans, in crystal glasses, at parties, at bars, and sometimes when no one else wanted to be with me. best friends forever, you’ve always said! i went to florida two weeks ago with some high hopes, and i didn’t think you were going to get so . . . . well, aggressive. i was going to visit with facebook friends in tallahassee, tampa, and orlando. i was going to bring my dad justin along with me. we were going to bond. you were going to be just something i had with dinner–or before flights. bonding with my father is an ongoing process. he and my mother placed me for adoption when i was three years old. this is a picture of me and my new mother on the morning i was baptized, a few weeks after the adoption became final. 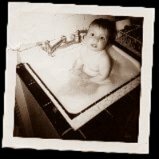 i met my father and mother when i was twenty five years old–using a private detective to track them down. the day before the trip, my dad texted me and said he didn’t feel he was up to traveling with me from his place in tallahassee to the other cities in florida. i would stay with him and his wife on sunday evening, rent a car and sally forth throughout the state, returning on friday to catch a plane back to chicago. but when i got to florida, i was surprised to discover that my father justin’s wife was going on a business trip. and that justin was a lot sicker than i had ever imagined. and that he was undergoing provenge treatment over the course of the week and the clinic wanted someone with him. that person would be me. i cancelled all the facebook friend visits outside of tallahassee. my friends were so understanding. i was going to bake a cake with jennifer in tampa and she said “no problem” and made the cake on her own and posted it on my wall. 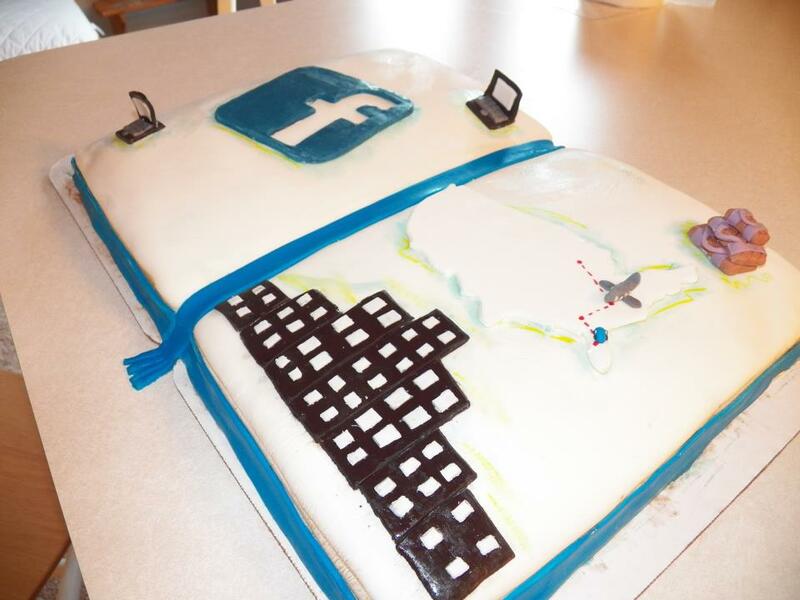 the cake tells the story of my visits to see facebook friends all over the world. thank you jennifer! the first phase of the provenge treatment went well. justin and i watched television while his blood was taken from one arm, processed through a machine and reinserted (minus white blood cells) into the other. he was weak, he slept most of the days, he had no appetite. he slept in the master bedroom, i slept in the guest room. his wife came home on wednesday evening. i volunteered to take justin to phase two of his provenge treatment on friday before my flight. he would be given a very high dose of benadryl and his own white blood cells–new and improved by some mysterious process–would be reintroduced to his body. he needed to have someone help him get home. also, it’s just good to have someone be an advocate for your care. especially since provenge is still in its experimental phase. justin is actually the first person in tallahassee to get the provenge treatment. it went well, by the way, and he says he feels better. he will get two more treatments. i’m not sure what happens after that. i felt the hostility. it’s always been there lurking beneath a surface of tight smiles–and it dates back to the total shock it must have been for her as a newlywed to have me show up saying “hi, i’m justin’s daughter!” i sympathize. i really do. i sat at the dining room table. she woke justin and an argument ensued between them, with each hushing the other as if they believed i couldn’t hear. she wanted me out of there. right then. it went beyond a desire to not sleep with a snorer. and yes, i heard every word. i felt rejected, belittled, demeaned, and exactly like a three year old who doesn’t understand why she can’t go home again. to her real home. why she has to be thrown away, because that’s what adoption meant to me. and i would have left right then, walked out of the apartment and said “good luck to you guys” but i was scared of leaving my dad. she went to work. i sat on the couch with him. i said “this is exactly the horrible feeling that makes me want a drink.” and he said “me too” and he got up, went to the refrigerator and we drank two beers. it was nine thirty, alcohol, a little early wouldn’t you say? but you were there for me. and for him. but that feeling, that wretched feeling followed me out of florida, back to illinois, everywhere i am, everywhere i go. rejected, belittled, a failure, a wreck. i’ve lost friendships, i’ve lost the respect of people i respect, i’ve lost love–the very things i have always wanted but you’re always there, aren’t you? ready to console me. ready to tell me it’s all right. ready to tell me i’m pretty and witty and funny and i mean something. and you keep saying you’ll never never leave me and i thought that was a good thing. what i’ve always wanted to hear. but coming from you, maybe it’s not such a good thing. i’ve tried breaking up with you before. white knuckling it. alcoholics anonymous. a chinese acupuncturist who also threw in a few extra needles that were supposed to make me lose weight in addition to sobering me up. nothing worked. you always came back and always when i really need you and can’t resist you. this time i’m getting outside help. i’m scared. i’m crying right now as i write this. you have been a reliable friend. but i can’t do this anymore. i’m breaking up with you. and really, it’s not you. it’s me. when i made a new years resolution to meet all my facebook friends, i met quite a few who have made the same decision, who have had the breakup talk with you. some have been successful. some not so much. some have done it on their own. some have needed what i’m about to do. i hope all my facebook friends, all my friends, all my family can understand. alcohol, i never meant for our relationship to be so . . . monogamous. my biological mother gave me this picture when she met me. alcohol, this was a gal with promise and potential and i want to get that back. This entry was posted on Monday, September 24th, 2012 at 3:35 pm	and tagged with adoption, alcohol, alcoholism, breakups, crystal glasses, facebook, facebook friends, fear, friend visits, friendship, loneliness, private detective, provenge, rejection, treatment, white wine and posted in Uncategorized. You can follow any responses to this entry through the RSS 2.0 feed. Definitely – we’ll have so much fun! I’m all for the Vogue thing!!!!!!! I will be keeping you in my prayers as always. I am cheering for you on the side-lines…Go Arlynn! Go Arlynn! You can do it! (with some added strength from our Creator, Almighty God) You are never alone! I believe you will come through this better than you have ever been! As always I will be keeping you in my prayers. I will be on the side-lines cheering for you…Go Arlynn! You can do it! (with the strength and power from our Creator, Almighty God) You are never alone, Arlynn! You will come through this and be better than you have ever been! You have been a great blessing to me and to all of the other lives that you touch! Praise the Lord, for Him delivering you into our lives! We love you, Arlynn! thank you juanita, i need those prayers! How brave ArLynn! Good for you for putting it out there and your commitment. Let’s talk soon. What I hear more than an alcohol problem is an abandonment problem. I’m sure you know that when you don’t have alcohol to drown those feelings anymore, they’ll come whooshing to the surface like a bunch of balloons from the bottom of a swimming pool.They were more than you could deal with when you were three, but now you can face them, feel them, express them, and integrate them. As you go through this process, you will become more free and joyful than you’ve ever imagined you could be. The freedom and joy are available to you. They are your birthright. When things get dark, hang onto that. You are on your way to someplace better than where you are now, someplace better than you’ve ever been. You will get there. You have plenty of coping skills, LOTS of people who love you and support you, and you are surrounded by angels (I don’t usually say this kind of thing) who want to lift you up in every possible way. The whole universe is rooting for you! We’re waiting to see that joyful ArLynn, radiant with self-love and peace. I can see her already, even if you can’t. colleen, or should i say miss perimenopausal woman? with great superpowers! we do share the same struggle. i hope i succeed and i can share how it works for me. i’ve definitely tried the traditional stuff–i’m part of the eighty five percent who try a.a. and fail. and the chinese acupuncturist just succeeded in taking my checks. i am working on this and i appreciate your friendship more than you know! i can’t see her, but i believe you that she will meet me in the mirror one day. many thanks rachel and by the way is it too cold out there now for a visit? i HATE sleeping in my car, but it has made me appreciate showers and staying in one place! you’re in kansas, yes? how far from kearney missouri? because i’ll be there tomorrow night with my tooth brush if you say the word! I don’t know Kearney, but I’m guessing it’s in the neighborhood of 3 hours driving. I’ll be out in the evening, but have time Fri. AM. Should I save a room? I have been busy finishing up my masters thesis but now I have completed my 3 year stress and off to a new job. Teaching in Turkey last year was a fabulous experience and so much fun. Cousin Maria met me in Ankara in December and we traveled for 3 weeks on buses with no cell phones and stayed in small villages. I am sorry for the mix up we had last year but I value you as a friend and one I want to reconnect with. I take Facebook with a “grain of salt.” It is good for keeping in touch with friends, however I’m not sure how successful it is at making new friends. I have always admired you and the obstacles and challenges you have successfully overcome. I leave for Saudi Arabia tomorrow for a new job. I will be back in the states next summer visiting my mother and cousin Maria at Tony Stone. Please plan a trip up to Northern Michigan next summer and visit with cousin Maria and myself at our cabin at Horse Shoe Lake. I’ll be in Michigan for a month then back to the Kingdom. I wish you well and keep in touch. hello to elburn and many thanks sandy! ArLynn – I’ve been watching you move these rocks for some time now. You’ve accomplished great things and will accomplish many more. You’ve done this with a strength and resolve that is God given and what makes you ArLynn. Here’s something that I’ve observed and believe it to be the truth. You of course have a “novelist’s eye” and have captured a very useful picture of what’s going on around you that I think I can with some accuracy offer you something in the way of a useful observation. What you’re actually experiencing and being afflicted with is the dirty aftermath of OTHER people’s failures and the bad days that THEY are having, not YOUR failures, not YOUR bad day but theirs. You’re a compassionate person that internalized OTHER people’s abject failure to take responsibility for their own actions, somehow hoping that if they closed their eyes and imagined you away, the problem of a 3 year old girl being cast adrift into the world would simply go away. But – you had the unmitigated gaul of surviving, building a family, getting through law school, and producing something motivated by the idea of touching other people’s lives. They try to get you to believe that somehow – these are your failures and shortcomings. Your existence and re-entrance into the lives of people that have FAILED you, themselves and others at so many different levels is an affront that shames, embarrases, and angers them. Don’t have their bad day and don’t be ashamed for your part; the loss of face is not yours. You don’t need their view of the world or the alchohol that provides a buffer between you and their deficient behaviors. Life is short – spend it with the people that you can help and make you laugh. Well said, Don Wainwright!!!!! I think you hit the nail on the head. Listen to Don, Arlynn. He’s right. WOW!! Don says it SO well, and I KNEW it! but put it into words I could not find. He is SO right!! YOU failed NO ONE! You’ve been a champion all along! You were just lost in the woods for a while. But now night has turned to day, and that star will ALWAYS shine! GO STRONG! GO ARLYNN! don, this is something i really need to think about and i welcome your insight! today i start the program and i’m scared. but it’s been a rough summer, losing my house and this florida stuff. i am so so so grateful for friends like you! Keep your inner light burning and stay strong. What a brave post! many thanks marty! i will try and that’s the best i can do. mark, i am so glad to hear from you and so glad i have your best wishes. you’re somebody i admire greatly and wish i was more like you! Best Friend; Kristin Chenoweth (4 foot – 11 inch salesman for personal security products, mace, stun guns, etc). Dear Arlynn, my heart goes out to you. 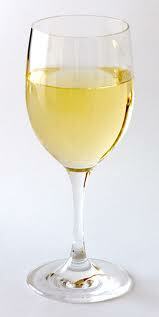 My issues has never been with alcohol – I just keep marrying men to whom it gives all of the things you mentioned. I used to hate it! Now I just love my hubby through it and he seems to need less. But it’s still his first ‘go-to’ coping skill. But he is the most self-honest soul I know and most of the time he’s got a good handle on it. Cheers to you – of course with a healthy glass of V-8!